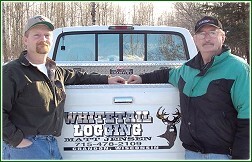 Whitetail Logging was established in 1987, by Pete and Matt Jensen, a father and son team of professional loggers. Pete, Matt's father, grew up on a small farm in Marinette County and learned to cut wood during the winters with his father. After a tour in the Army, Pete worked in Chicago for 18 months before coming home to Wabeno. Pete has done all types of logging from horse logging to being a sawyer for years and now has operated a forwarder for many years. Matt grew up in Wabeno and also went into the woods to learn wood cutting with his father. He worked construction and delivered and installed hardwood staircases around the country before coming back to logging. Matt started as a sawyer, then a forwarder operator, and now he runs the 911.4 Valmet Harvester in their operation. Both Matt and Pete are active members of the Great Lakes Timber Professionals Association. 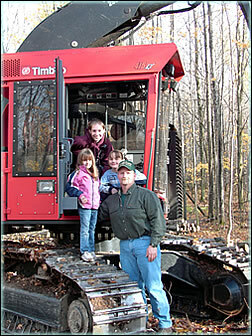 Matt has served as the President of the Wisconsin Professional Loggers Association. Land Management can produce Improved Wildlife Habitat � Management can develop a mixture of habitats on your property, increasing biodiversity, and providing needed habitat for some species whose habitat needs aren�t adequately met, as well as protecting cavity trees and other important resources for wildlife.